The U.S. Green Building Council's annual list of the top states for green building once again puts Maryland and Virginia in the top 10, and if D.C. were a state, it would easily rank as No. 1. WASHINGTON — The U.S. Green Building Council’s annual list of the top states for green building once again puts Maryland and Virginia in the top 10, and if D.C. were a state, it would easily rank as No. 1. 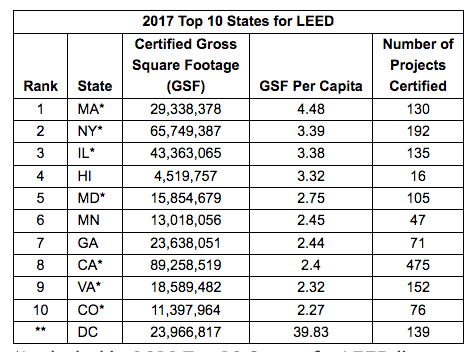 The list, based on LEED (Leadership in Energy and Environmental Design) certification, ranks states based on certified square feet per capita in 2017. To qualify for LEED certification, projects must use less energy and water and be built to sustainable standards that reduce carbon emissions and create a healthier environment for communities. “The Mid-Atlantic continues to show strong regional leadership, with both Maryland and Virginia returning to the list for the seventh year running,” the Green Building Council said. The District had 139 projects certified as LEED last year. Last fall, the Green Building Council named the District as the first city in the world to receive the LEED for Cities Platinum award, the highest certification given by the Green Building Council. The District’s “Sustainable DC Plan,” a vision for sustainable initiatives in D.C., has a stated goal of making the District the healthiest, greenest and most livable city in the U.S. by 2032. Maryland ranked No. 5 on this year’s list, with 2.75 square feet of green construction per capita. Virginia ranked No. 9, with 2.27 square feet per capita. Massachusetts led the top 10 states for green building, with 4.48 square feet per capita and 130 projects certified LEED in 2017. Nearly 1,400 commercial and institutional projects achieved LEED certification within the top 10 states last year, with a total of more than 2,600 projects nationwide achieving the certification.